﻿ Mark 9:24 With tears flowing, the child's father at once cried out, "I do believe! 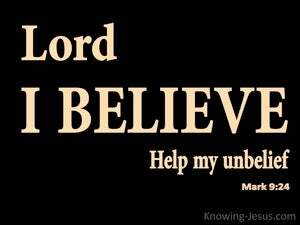 Help my unbelief!" Immediately the father of the boy cried out, "I do believe! Help my unbelief." And straightaway the father of the child having cried out, he said with tears, I believe. Lord, help thou my unbelief. Immediately the father of the boy cried out, "I do believe; help me to have more faith." And immediately the father of the child cried out, and with tears said: Lord, I believe; help my unbelief. Straight away the father of the child gave a cry, saying, I have faith; make my feeble faith stronger. immediately the child's father cryed out with tears, I do believe, oh supply the defect of my faith. And immediately the father of the young child crying out said with tears, I believe, help mine unbelief. And immediately the father of the child crying out with tears, continued to say, I believe; assist thou my unbelief. The boy's father immediately cried out, "I have faith! Help my want of faith!" And straightway the father of the child crying out, said with tears, Lord, I do believe: help thou mine unbelief. And quickly the child's father having cried out with tears, said, I believe, O Lord, help thou mine unbelief. And immediately the father of the child cried out and said with tears, Lord, I believe. Help my unbelief. And straightway the father of the child cried with tears, saying, "Lord I believe, help mine unbelief." At once the father of the boy cried out, "I do believe; help my unbelief." The boy's father with a cry said instantly. "I do believe; help my unbelief." 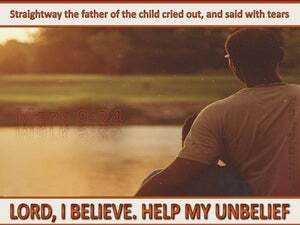 Immediately the father of the boy cried out and said, "I believe; help my unbelief!" Immediately the father of the child exclaimed, "I believe. Help my unbelief." The father of the child immediately cried out and said, I believe; help thou my unbelief. And the father of the little child immediately crying out, said, I believe; help my unbelief. Straightway crying out, the father of the child was saying - I have faith! help my, want, of faith. And immediately the father of the child said with tears, I believe, Lord! 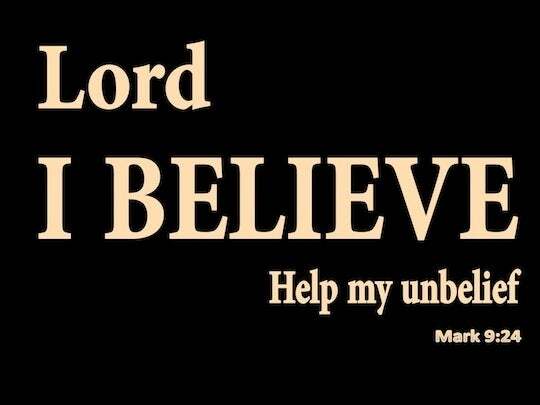 help my unbelief! The boy's father immediately cried out: "I have faith; help my want of faith!" And immediately the father of the child cried out, and said with tears, Lord, I believe; help thou my unbelief. Immediately the father cried out, "I do believe: strengthen my weak faith." The boy's father at once cried out and said, "I do have faith; help my lack of faith!" Straight-way the father of the child, crying out, said, "I believe; help Thou my unbelief!" And the father of the child immediately cried out and said with tears, Lord, I believe, help thou my unbelief. 23 Jesus told him, ""If you are able?' Everything is possible for the person who believes!" 24 With tears flowing, the child's father at once cried out, "I do believe! Help my unbelief!" 25 When Jesus saw that a crowd was running to the scene, he rebuked the unclean spirit, saying to it, "You spirit that won't let him talk or hear I command you to come out of him and never enter him again!" Then the apostles told the Lord, "Give us more faith!" Hear my prayer, LORD, pay attention to my cry, and do not ignore my tears. I am an alien in your presence, a stranger just like my ancestors were. Those who weep while they plant will sing for joy while they harvest. "And deliver this message to them: "Let tears run down my face, night and day, and don't let them stop, because my virgin daughter my people will be broken with a powerful blow, with a severe wound. Then, turning to the woman, he told Simon, "Do you see this woman? I came into your house. You didn't give me any water for my feet, but this woman has washed my feet with her tears and dried them with her hair. Peter was still thinking about the vision when the Spirit told him, "Look! Three men are looking for you. I wrote to you out of great sorrow and anguish of heart along with many tears not to make you sad but to let you know how much love I have for you. Brothers, at all times we are obligated to thank God for you. It is right to do this because your faith is growing all the time and the love every one of you has for each other is increasing. recalling your tears and longing to see you so that I can be filled with joy. As a mortal man, he offered up prayers and appeals with loud cries and tears to the one who was able to save him from death, and he was heard because of his devotion to God. For you know that afterwards, when he wanted to inherit the blessing, he was rejected because he could not find any opportunity to repent, even though he begged to repent with tears.